It’s clear to see that the outstanding JoJo Siwa has created an amazing empire in the entertainment world. From having a countless amount of terrific, consumer products to releasing tons of awesome songs and music videos – everything that JoJo Siwa works on turns to gold. She truly does deserve all of her achievements as she is such a hard-working, young lady. Although her tour hasn’t officially started yet, it already is a massive success as 17 more shows have been added – making Nickelodeon’s JoJo Siwa D.R.E.A.M. The Tour reach a total of 70 shows! Fans will definitely be able to have a blast joining JoJo Siwa and all of the fun she will bring to the stage. Siwa’s tour is presented by Party City and produced by Nickelodeon and AEG Presents. The excitement doesn’t stop there! After the release of her debut EP, D.R.E.A.M. The Music back in November, JoJo Siwa is bringing fans even more new music that they can jam out to with the release of her second EP, Celebrate on Friday, April 12th. Celebrate includes four songs: “It’s Time to Celebrate,” “#1U,” “Worldwide Party,” and “Bop!” Now, fans will have tons of songs they can sing along to during Siwa’s much-anticipated tour. Nickelodeon also announced that the world premiere of JoJo Siwa’s brand new music video for her song, “It’s Time to Celebrate” will take place on Saturday, April 13th. Needless to say, Siwanatorz (aka JoJo Siwa fans) have a bunch of spectacular things to look forward to this week from the multi-talented, young lady. 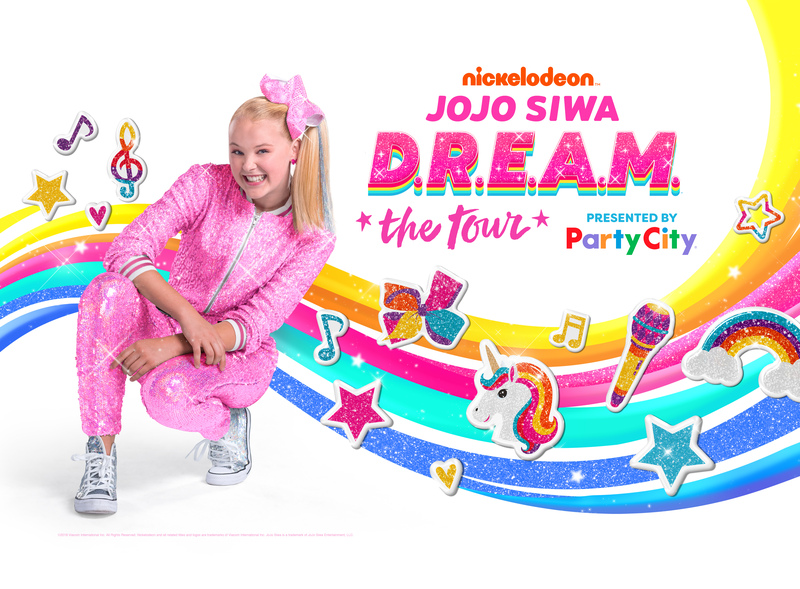 Check out the full list of tour dates for Nickelodeon’s JoJo Siwa D.R.E.A.M. The Tour below including the brand new show dates just recently announced! Comment below and tell me or tweet me at @alexisjoyvipacc, will you be seeing JoJo Siwa on tour? July 18 Richmond, VA Virginia Credit Union LIVE! *Venues not participating in the American Express® Card Members presale. **Venues participating with American Express® Blue Card Members only. Previous VIPAccessEXCLUSIVE: “The Curse Of La Llorona” Star Roman Christou Interview With Alexisjoyvipaccess! Next Article: 5 Reasons Why We Can’t Wait To See Netflix’s “No Good Nick” Premiering April 15th – Watch The Trailer Here!